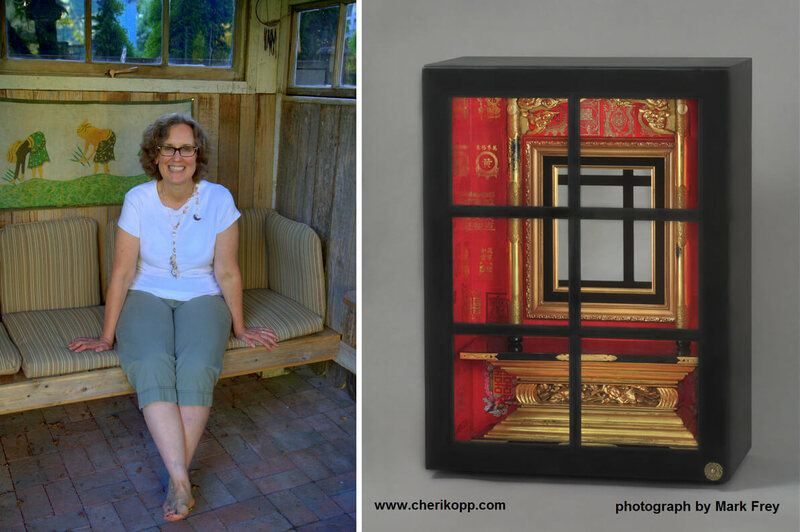 When I called Cheri Kopp, a Seattle mixed-media artist, about interviewing her for The RE Store website, she told me she thought it would be better if I visited her at her home, where she creates her art. “Seeing is believing,” she said. And she was right. While all of her pieces share elements of mixed media mosaics or assemblages that share a 3D sculptural quality, the scope of her work is broad ranging, and perhaps that’s one reason she has found some success. She is always looking at used things with new eyes, and is always open to inspiration. Cheri’s bins of organized cast off materials (left) and “Not Your Grandma’s Flower Garden Quilt” made of foil tops from food containers, appeared in the 2011 Seattle Recycled Arts Show. Cheri’s basement and garage are filled with numerous bins and containers (above, left) of very neatly organized cast-off materials that she has either found or generated as a result of household consumption—in other words, trash. She collects whatever strikes her fancy. “I have no idea how I’m going to use any item, until one day it all just comes to me.” She has collections of plastic caps and lids sorted by color; foil yogurt tops, all washed and neatly flattened (see more about this piece in the caption, above, right); popsicle sticks that have been run through the dishwasher; a cluster of multicolored hair bands, often picked up while walking in her Ravenna neighborhood; beach items trekked home from walks along the shores; and other seemingly random items too numerous to name. “I’m almost a hoarder,” she laughs. I assure her that hoarders are far less organized than she is. Her collections of working materials are almost unobtrusive in the rooms in which they’re housed. Left to right – “You Are What You Eat”, “Can’t Top Vegan” and “Mostly Organic” – two of which have been in The RE Store’s Recycled Arts Shows over the years. And marquee letters found at The RE Store, now in Cheri’s studio. Cheri’s first art show was the Fifth Annual Recycled Art and Fashion Show at The Seattle RE Store in 2006. She entered her compelling piece entitledYou Are What You Eat. She has since gone on to exhibit in 24 juried and/or curated group shows, 13 group shows, and one solo show. Her work was recently included in the Center on Contemporary Art’s (CoCA) Collision curated show, on display through September 14th, with 150 other artists from across the country and Switzerland, and her work is currently available for viewing at the group show The Meaning of Wood at The Rose Center Art Gallery at Lower Columbia College in Longview, WA. You can find out more about Cheri at her website, www.cherikopp.com. Special thanks to Christine Clifton-Thornton for authoring this article.